Mael Mix 10" picture disc. "Suedehead" was Morrissey's debut single as a solo artist. Released on 27 February 1988 by HMV Records, the single came a mere nine weeks after The Smiths' single "Last Night I Dreamt That Somebody Loved Me" from their final album, Strangeways, Here We Come. "Suedehead" was produced and co-wrote by Stephen Street, and was the first single released from Morrissey's debut album, Viva Hate. Recording for Viva Hate commenced at The Wool Hall studios in Bath, England in early October and would last until late December. During one of the sessions, EMI executives stopped by the studio to check up on the recording progress, to which Street played them a rough mix of "Suedehead". 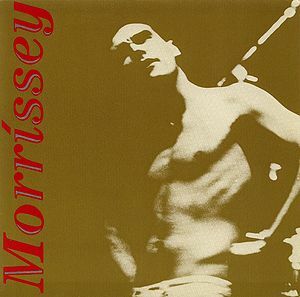 The executives responded positively which, according to Street, gave he and Morrissey a better sense of freedom with the album and the confidence that they were heading in the right direction. Upon release, "Suedehead" reached the #5 slot in the UK charts. With the momentum of a hit single, two weeks later Viva Hate was released and debuted at #1 on the charts. "Suedehead", as remixed by Ron and Russell Mael of Sparks (6:37) was released on the Rhino Records UK compilation Future Retro (Jan. 24, 2006). Ron and Russell were invited to take part in a themed remix album called The 80’s Remixed on which various artists get to remix another compatible or comparative artist whom they admire. Warner Bros. gave the Maels the choice of remixing a Smiths song or a Morrissey song. They chose to do a unique and extreme 6-1/2 minute remix of “Suedehead”, and Moz happily gave them his blessing. The masterful Mael mix is heavy on vocals and set to a completely different chord progression. The label was gracious enough to let Ron and Russell do their own thing, sparing them the horror of doing a redundant club mix. The album will be released in the UK in April. On 21 April 2012, in celebration of Record Store Day, EMI released a limited edition 10" picture disc, and a subsequent digital download on 23 April, of "Suedehead" (Mael Mix), edited down from the original version released in 2006 from 6:37 to 3:35. The single also feature two previously unreleased BBC live versions of "We'll Let You Know" and "Now My Heart Is Full", recorded at London's Theatre Royal, Drury Lane in February 1995. Why do you come here When you know it makes Things hard for me? When you know, oh Why do you come? "Suedehead" filming / Fairmont Indiana photos by Kevin Cavanaugh from 1988 - Morrissey-solo forums, original story from Kevin Cavanaugh (Mar. 20, 2003). Morrissey's nephew Sam Rayner in "Suedehead". - post by sensible, Morrissey-solo forums (July 26, 2004). The camera that Morrissey uses in "Suedehead". - post by Librarian on Fire, Morrissey-solo forums (Feb. 1, 2005). Morrissey leaves his mark in Fairmount, IN - post by mozmal, Morrissey-solo forums (Aug. 31, 2008). ↑ presley1. (2005-04-11). Future Retro (out Jan. 24) includes "Suedehead" (Sparks mix,) listening party stream. Morrissey-solo. Retrieved from morrissey-solo.com. ↑ Sven68. (2005-04-11). "Suedehead" - remix by Sparks to be released on "The 80's Remixed" (April). Morrissey-solo. Retrieved from morrissey-solo.com. This page was last modified on 27 May 2014, at 12:43.